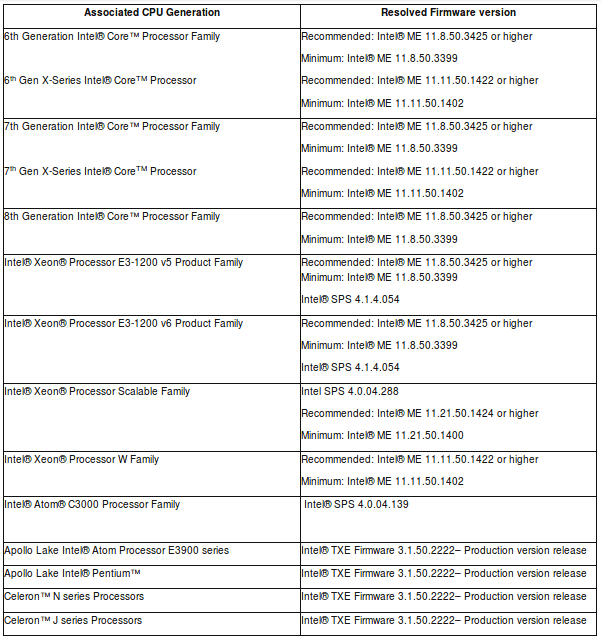 Intel identified eight security vulnerabilities and released security advisory last week, affecting Intel core CPU technologies Intel Management Engine (ME), Server Platform Service (SPS) and Trusted Execution Engine (TXE). These vulnerabilities allow an unauthorized process to access privileged content, attackers with local or remote admin access to the system to execute arbitrary code and that place millions of servers and computers at risk. Management Engine also known as the Manageability Engine is an autonomous subsystem that has been built into all Intel CPU since 2008. And it has access to almost all information including network adapters, system memory etc, which, if exploited would allow complete compromise of vulnerable PCs, laptops, or servers. Intel ME firmware affected by multiple buffer overflow (CVE-2017-5705) vulnerabilities, which allow attackers with local access to execute arbitrary code on the targeted system. This component is also affected by multiple privilege escalation (CVE-2017-5708) vulnerabilities, which allows unauthorized process to access privileged content via unspecified vector. Intel Server Platform Service in based on Intel ME, which allow remote configuration of Intel-powered servers over the network. Intel Server Platform Services affected by Multiple buffer overflow and privilege escalation vulnerabilities are found in the kernel (CVE-2017-5706, CVE-2017-5709). Intel Trusted Execution Technology is a computer hardware technology assures that an authentic operating system starts in a trusted environment, which can then be considered trusted and verify the authenticity of a platform and its operating system. Intel TXE firmware is affected by multiple buffer overflow (CVE-2017-5707) vulnerabilities, which allow attackers with local access to execute arbitrary code on the targeted system. This component is also affected by multiple privilege escalation CVE-2017-5710) vulnerabilities, which allows unauthorized process to access privileged content via unspecified vector. These security vulnerabilities can be leveraged by logged-in users or malicious applications to extract confidential and protected information from the computer’s memory, potentially giving sensitive information passwords or cryptographic keys to trigger other attacks. The vulnerabilities can also be exploited by network administrators, or people masquerading as admins, to remotely infect machines with spyware and invisible rootkits, potentially. Most of these weaknesses are limited by the fact that it requires local access, either as an administrator or less privileged user; the rest require you to access the management features as an authenticated sysadmin. 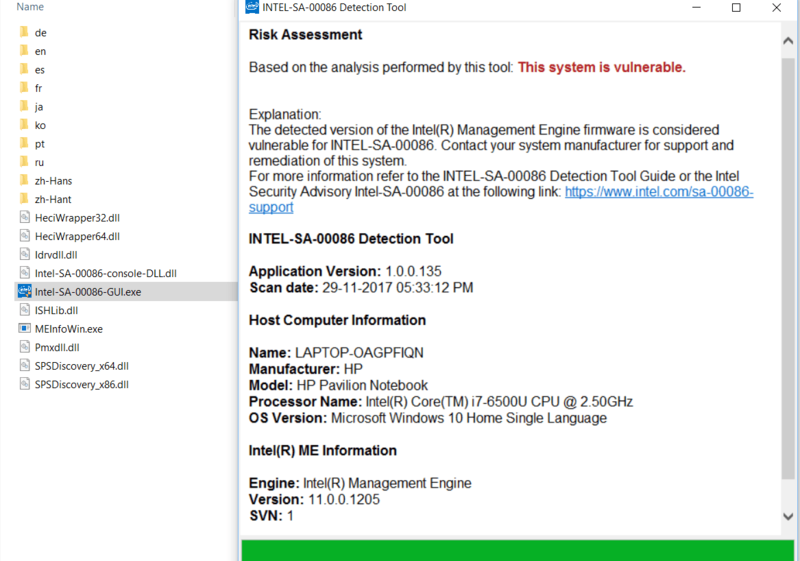 Intel has published a detection tool to help users to check, if their systems are exposed to these vulnerabilities. Separate downloads are available for Window And Linux. On Windows, download and run Intel-SA-00086-GUI.exe executable, which analyses Intel components on your local system and shows report saying your system is vulnerable or not as show in the below image. The system is detected as vulnerable according to Intel-SA-00086 Detection tool. Here the Intel processor is having Intel ME with vulnerable firmware version (11.0.0.1205). Similarly, On Linux download and run intel_sa00086.py python script, which analyses Intel components on your local system and shows report saying your system is vulnerable or not as show in the below image.